How does Kevlar work? | Why is Kevlar so strong? Nature has given us some amazing materials. There's wood: a material so strong and versatile you can use it for everything from making paper to building houses. There's also wool, with insulation so effective it lets sheep stand outside in the snow all winter. Or how about skin: a material that will repair itself automatically and often completely invisibly in only a matter of days? Truly incredible though these materials are, they're far from perfect for every application, especially in the modern world where the challenges we face are ones nature could never have anticipated. That's why we now rely on synthetic materials such as Kevlar®. It's a plastic strong enough to stop bullets and knives—often described as being "five times stronger than steel on an equal weight basis." It has many other uses too, from making boats and bowstrings to reinforcing tires and brake pads. Let's take a closer look at how it's made and what makes it so tough! Photo: A piece of Kevlar after being hit by a projectile. You can see a dent (coming up toward the camera)—but you can't see a hole. You might be bruised by this impact (or suffer what's called a "blunt trauma" injury), but you wouldn't die. Picture courtesy of US Army. Kevlar is one of those magic modern materials people talk about all the time without ever really explaining any further. "It's made of Kevlar", they say, with a knowing nod, as though that were all the explanation you needed. Kevlar is simply a super-strong plastic. If that sounds unimpressive, remember that there are plastics—and there are plastics. There are literally hundreds of synthetic plastics made by polymerization (joining together long chain molecules) and they have widely different properties. Kevlar's amazing properties are partly due to its internal structure (how its molecules are naturally arranged in regular, parallel lines) and partly due to the way it's made into fibers that are knitted tightly together. 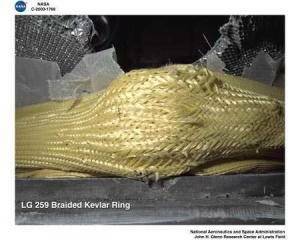 Photo: Kevlar textiles get their properties partly from the inherent strength of the polymer from which the fibers are made and partly from the way the fibers are knitted tightly together, as shown here in a NASA ballistics test. Picture courtesy of NASA Glenn Research Center (NASA-GRC). Synthetic materials are made in a chemical laboratory (unlike natural textiles such as cotton, which grows on plants, and wool, which comes from animals). Aromatic means Kevlar's molecules have a strong, ring-like structure like that of benzene. Polyamide means the ring-like aromatic molecules connect together to form long chains. These run inside (and parallel to) the fibers of Kevlar a bit like the steel bars ("rebar") in reinforced concrete. Polymer means that Kevlar is made from many identical molecules bonded together (each one of which is called a monomer). Plastics are the most familiar polymers in our world. As we've seen, the monomers in Kevlar are based on a modified, benzene-like ring structure. Like Nomex, Kevlar is a distant relative of nylon, the first commercially successful "superpolyamide", developed by DuPont in the 1930s. Kevlar was introduced in 1971, having been discovered in the early 1960s by chemist Stephanie Kwolek, who earned US Patent 3,287,323 for her invention, with Paul Morgan, in 1966. What's so good about Kevlar? Photo: Super-strong Kevlar is best known for its use in body armor. Picture by Lcpl Joseph A. Stephens courtesy of United States Marine Corps. Unlike most plastics it does not melt: it's reasonably good at withstanding temperatures and decomposes only at about 450°C (850°F). Unlike its sister material, Nomex, Kevlar can be ignited but burning usually stops when the heat source is removed. Kevlar can resist attacks from many different chemicals, though long exposure to strong acids or bases will degrade it over time. In DuPont's tests, Kevlar remained "virtually unchanged" after exposure to hot water for more than 200 days and its super-strong properties are "virtually unaffected" by moisture. It's worth noting that Kevlar also has its drawbacks. In particular, although it has very high tensile (pulling) strength, it has very poor compressive strength (resistance to squashing or squeezing). That's why Kevlar isn't used instead of steel as a primary building material in things like buildings, bridges, and other structures where compressive forces are common. 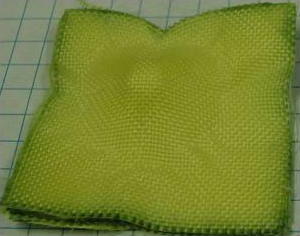 There are two main stages involved in making Kevlar. First you have to produce the basic plastic from which Kevlar is made (a chemical called poly-para-phenylene terephthalamide—no wonder they call it Kevlar). Second, you have to turn it into strong fibers. So the first step is all about chemistry; the second one is about turning your chemical product into a more useful, practical material. Polyamides like Kevlar are polymers (huge molecules made of many identical parts joined together in long chains) made by repeating amides over and over again. Amides are simply chemical compounds in which part of an organic (carbon-based) acid replaces one of the hydrogen atoms in ammonia (NH3). So the basic way of making a polyamide is to take an ammonia-like chemical and react it with an organic acid. This is an example of what chemists call a condensation reaction because two substances fuse together into one. Artwork: Kevlar's monomer: C=carbon, H=hydrogen, O=oyxgen, N=nitrogen, — is a single chemical bond, and = is a double bond. This basic building block is repeated over and over again in the very long chains that make up the Kevlar polymer. Source: "US Patent: 3287323: Process for the production of a highly orientable, crystallizable, filament" by Stephanie Kwolek et al. You probably know that natural materials such as wool and cotton have to be spun into fibers before they can turned into useful textile products—and the same is true of artificial fibers such as nylon, Kevlar, and Nomex. The basic aramid is turned into fibers by a process called wet spinning, which involves forcing a hot, concentrated, and very viscous solution of poly-para-phenylene terephthalamide through a spinneret (a metal former a bit like a sieve) to make long, thin, strong, and stiff fibers that are wound onto drums. The fibers are then cut to length and woven into a tough mat to make the super-strong, super-stiff finished material we know as Kevlar. Artwork: How Kevlar is made. 1) The rodlike Kevlar molecules start off in dilute solution. 2) Increasing the concentration increases the number of molecules but doesn't make them align. At this stage, the molecules are still tangled up and not extended into straight, parallel chains. 3) The wet-spinning process causes the rods to straighten out fully and align so they're all oriented in the same direction—forming what's called a nematic structure—and this is what gives Kevlar its exceptionally high strength. Image based on an original artwork from DuPont's Kevlar Technical Guide (see references below). Kevlar can be used by itself or as part of a composite material (one material combined with others) to give added strength. It's probably best known for its use in bulletproof vests and knifeproof body armor, but it has dozens of other applications as well. It's used as reinforcement in car tires, in car brakes, in the strings of archery bows, and in car, boat, and even aircraft bodies. It's even used in buildings and structures, although not (because of its relatively low compressive strength) as the primary structural material. What makes Kevlar such a good antiballistic material? 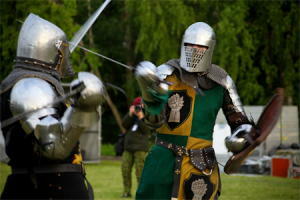 Photo: Think of Kevlar as a lightweight modern alternative to heavy, cumbersome, medieval suits of armor! Photo by Staff Sgt. Nate Hauser courtesy of US Marine Corps. If you've read our article on bullets, you'll know that they damage things—and people—because they travel at high speeds with huge amounts of kinetic energy. Although there's no such thing as completely "bulletproof," materials like bulletproof glass do a good job at protecting us by absorbing (soaking up) and dissipating (spreading out) the energy of a bullet. Kevlar is an excellent antiballistic (bullet- and knife-resistant) material because it takes a great deal of energy to make a knife or a bullet pass through it. The tightly woven fibers of highly oriented (lined-up) polymer molecules are extremely hard to move apart: it takes energy to separate them. A bullet (or a knife pushed hard by an attacker) has its energy "stolen" from it as it tries to fight its way through. If it does manage to penetrate the material, it's considerably slowed down and does far less damage. Although Kevlar is stronger than steel, it's about 5.5 times less dense (the density of Kevlar is about 1.44 grams per cubic centimeter, compared to steel, which is round about 7.8–8 grams per cubic centimeter). That means a certain volume of Kevlar will weigh 5–6 times less than the same volume of steel. Think back to medieval knights with their cumbersome suits of armor: in theory, modern Kevlar gives just as much protection—but it's light and flexible enough to wear for much longer periods. Chart: You need a greater thickness of Kevlar body armor to stop higher-speed bullets. If you fire a bullet faster than the penetration speed, it will pierce through the armor but exit with less speed than it entered, because the armor will absorb some of its kinetic energy. Please note that this chart is simply a very rough illustration; it's not based on any particular bullet type. If you think of Kevlar "soaking up" the energy of a bullet, it's fairly obvious that a greater thickness of Kevlar—more layers of the material bonded together—will give more protection. 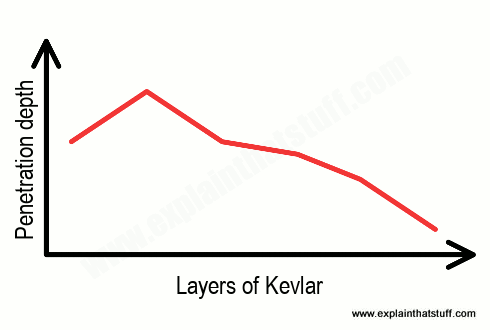 As you can see from this chart, the more layers you have, the faster you need to fire a bullet to get it to penetrate through Kevlar armor. In other words, if you want to protect soldiers against high-velocity rifle bullets, you're going to need much thicker armor than if you simply want to protect police officers against handgun bullets, which have lower velocity and less kinetic energy. You can see this clearly in the official US National Institute of Justice Body Armor Classification, which ranks bulletproof vests and other body protection (made of Kevlar and other materials) on a scale from I to IV for its ability to protect against bullets fired from weapons of different power. At the low end of the scale, type IIA armor has to protect against smaller handgun bullets (typically 9mm full metal jacketed bullets weighing 8.0g or 0.3 oz and fired at about 373 m/s or 834 mph); you need at least 16 layers of Kevlar for that. Higher up the scale, type IIIA armor has to resist more powerful handheld bullets (such as .44 Magnum bullets weighing 15.6 g or 0.6 oz and fired at 436 m/s or 975 mph); that needs twice as much Kelvar—at least 30 layers. It's important to note that even Kevlar has its limits. For protection against rifle bullets (ordinary ones or armor-piercing ones), which travel much faster (850–900 m/s or 1900–2000 mph) with considerably higher kinetic energy, Kevlar isn't enough: you need body armor made from steel or ceramic plates (classified as type III and IV). Kevlar Technical Guide: Definitive information from DuPont. This will take you to a 4MB PDF format version of the Technical Guide, which can take a while to download depending on your Internet connection. Kevlar's uses and applications: DuPont run through about 20 different common uses of Kevlar, from adhesives to vehicle armor. US Patent: 3287323: Process for the production of a highly orientable, crystallizable, filament: This is Stephanie Kwolek and Paul Morgan's original Kevlar patent (filed April 25, 1963 and granted November 22, 1966), which describes various chemical methods for making Kevlar. Enough for One Lifetime: Wallace Carothers, Inventor of Nylon by Matthew Hermes. Chemical Heritage Foundation, 1996. A dry but nonetheless interesting biography of the inventor of nylon (a material very similar to Kevlar). It gives a good sense of how modern, revolutionary materials tend to be "corporate inventions" rather than the work of single inventors. Kevlar 'Wallpaper' Could Protect Soldiers From RPG Blasts by Jordan Golson. Wired, May 29, 2015. How sheets of Kevlar "wallpaper" could be used to protect buildings and structures. Armor on the Field: The NFL's Headlong Race to Build the Unbreakable Linebacker by Sean Conboy. Wired, July 9, 2012. Could Kevlar padding help to protect sports competitors from serious injury? DuPont wins $900m Kevlar spy case: The Guardian, 15 September 2011. Kevlar is an extremely valuable invention and, like other technological pioneers, DuPont has to fight big legal cases to protect its "intellectual property." School uniforms made slash-proof: BBC News, 14 August 2007. Could Kevlar protect children against knife crime? Tribute to Inventive Women: BBC News, 27 November 2003. A short article about women inventors, including Stephanie Kwolek. High-modulus, high-strength organic fibers in Concise Encyclopedia of Composite Materials by Anthony Kelly (ed). Pergamon Press, 1989. This is a great introduction to the chemistry and physical properties of Kevlar and similar materials. "Nomex", "Kevlar", and "DuPont" are trademarks or registered trademarks of E. I. Du Pont de Nemours and Company.